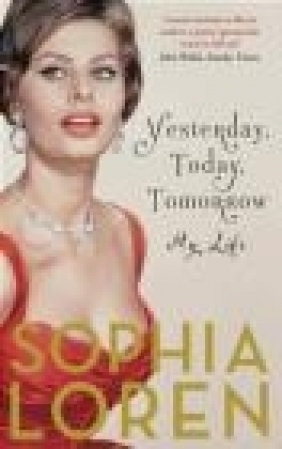 Yesterday, Today, Tomorrow is Sophia Loren's definitive autobiography, revealing her personal journey from the hardship of her childhood in Naples to her life as a screen legend, sharing stories of work, love, and family. Each chapter begins with a letter, a document, a photograph, or object that prompts her reminiscences. In her own words, these memoirs originated as, "Unpublished memories, curious anecdotes, tiny secrets told, all of which spring from a box found by chance, a precious treasure trove filled with emotions, experiences, adventures." In her incredible life story, Loren vividly recounts her difficult childhood in Naples during World War II, remembers her parents and their tempestuous relationship, and reveals the pain of growing up in her grandparents' house with her single, unmarried mother and younger sister. She tells how she got her start by winning a beauty pageant ('La regina del mare') and how her ambition drove her success in cinema before revealing the influence of the producer Carlo Ponti, who cast her in her early roles and later became her husband. Loren takes us behind the scenes of the movies, her early stardom and move to Hollywood revealing intimate and never before shared stories of her famed costars: Brando, Newman, Burton, Peck, Heston, and many more.